CERT training promotes a partnering effort between emergency services and the people that they serve. The goal is for emergency personnel to train members of neighbor-hoods, community organizations, or workplaces in basic response skills. CERT members are then integrated into the emergency response capability for their area. The Community Emergency Response Team course consists of 20 hours of classroom instruction provided by trained responders and exercises practicing the skills learned plus a 2 to 3-hour exercise/simulation after the conclusion of the course. CERT classes are free of charge. There is a minimum age for participation in a CERT program. You must be 18 to attend on your own or you can attend with a parent if you are at least 16. Teen CERT is being developed in several high schools as an option to get teenagers involved in disaster preparedness. During a recent power outage in Miami, Florida, the University of Miami ‘Canes Emergency Response Team was activated to assist with traffic management at congested intersections where traffic signals were out. Brooktails (California) CERT was activated to assist with a wildfire started by a lightning strike. Did you know that with debris-clogged or damaged roads, disrupted communications and the high volume of calls to emergency response personnel, you could be on your own for the first 72 hours after a disaster. 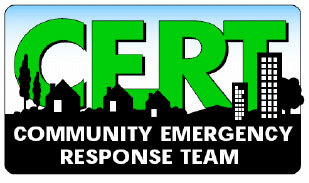 This website also contains information on locations of CERT teams and allows you to search for teams based on entering a ZIP code.